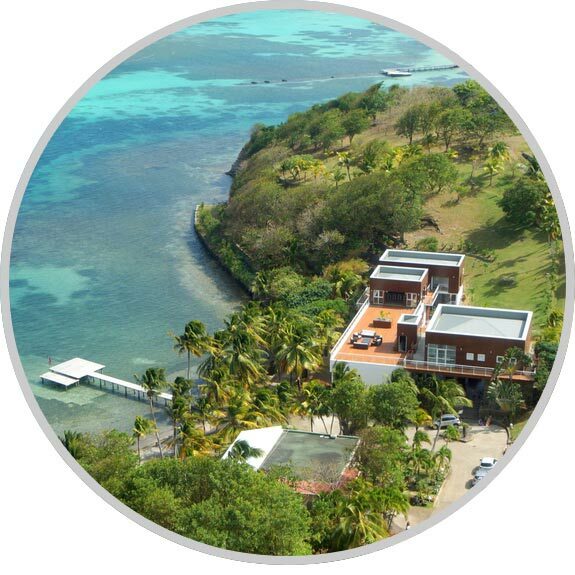 Located on the east coast of Martinique, at Pointe Cerisier in Le Francois, the “Domaine des Fonds Blancs”, our little piece of paradise, nestles in the lagoon along the most exclusive and famous area of the island. Between lush vegetation and turquoise lagoon, this luxury property over 17,500m2 offers one of the prettiest places on the island. To give this relaxing place the revival it deserves, it took nearly two years of work, commitment and passion. One imperative: to preserve its character and authenticity. Villa Isabelle (9 rooms) can accommodate up to 18 people. 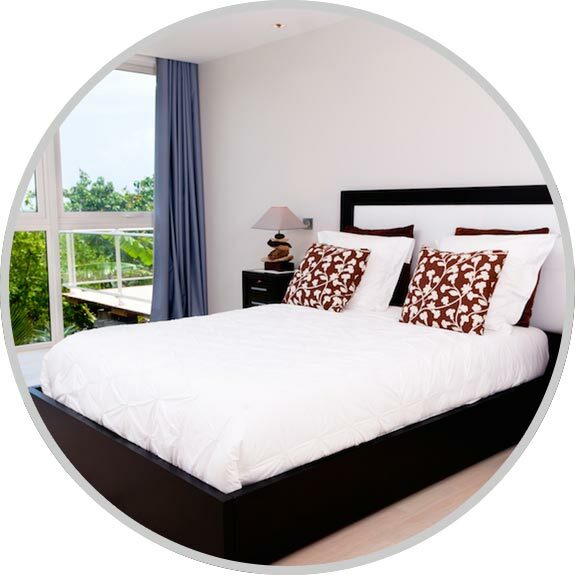 Villa Coralie (6 rooms) can accommodate up to 12/14 people. 1 open living/dining area of 110sqm with direct access to the kitchen and pool, garden & sea views. 2 air-conditioned living rooms with sea view. 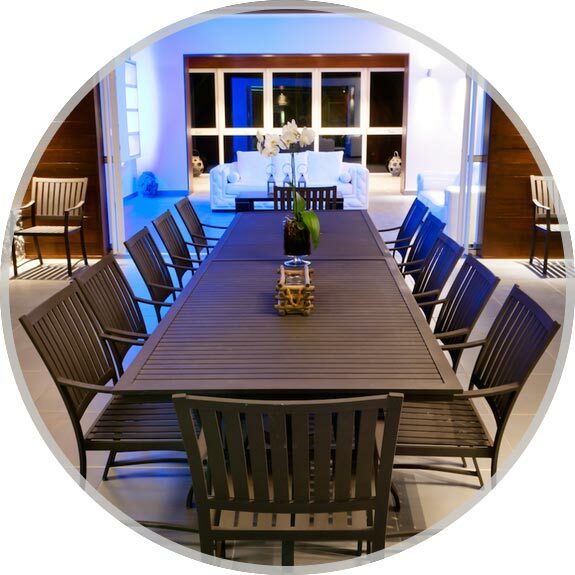 1 large dining room of 38sqm (sea view) equipped for 16 guests or 18 people for meeting room. Flat screen TV with Bose Home Theater System, DVD/Blu-Ray player, Apple TV, dining area with 2 AC units, 1 Guest Powder Room. 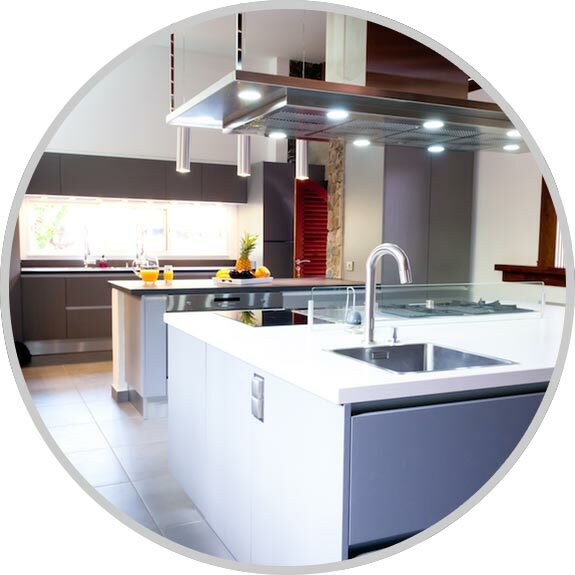 Steam oven, Microwave, dishwasher (x2), Refrigerator(x2)/freezer, Nespresso machine, toaster, juicer, wine cooler, ice machine, purified water fountain and various kitchen utensils. The kitchen has a serving hatch through the open living/dining area. King size bed, air-conditioning (3 AC units), dressing, Flat screen TV (55″) + Apple TV, Kitchenette, Office and make-up area, WiFi and Ethernet connexion, En-suite bathroom with shower tub indoor and outdoor, hairdryer, sea view. King size bed, air-conditioning, Flat screen TV (48″), Apple TV, Kitchenette, Office and make-up area, WiFi and Ethernet connexion, Walk-in closet, En-suite bathroom with shower tub, dryer, direct sea view. Queen size bed, air-conditioning, Flat screen TV, dressing table, Office and make-up area, WiFi and Ethernet connexion, En-suite bathroom with shower tub, dryer, sea view, can be connected to bedroom 5. Queen size bed, air-conditioning, Flat screen TV, Office and make-up area, WiFi and Ethernet connexion, En-suite bathroom with shower tub, dryer, sea view can be connected to bedroom 4. Queen size bed, air-conditioning, Flat screen TV, Office and make-up area, WiFi and Ethernet connexion, En-suite bathroom with shower tub, dryer, sea view. 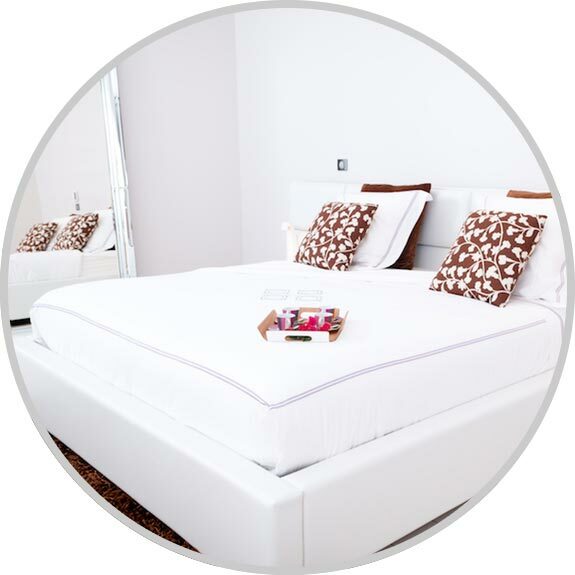 Queen size bed, air-conditioning, dressing, En-suite bathroom with shower tub, dryer, sea view. WiFi, Safe, Guests WC, Washing machine, dryer, iron and ironing board, baby’s bed and high chair on request. Pool, pontoon with direct access to the sea, seaside promenade, private sun tanning area. 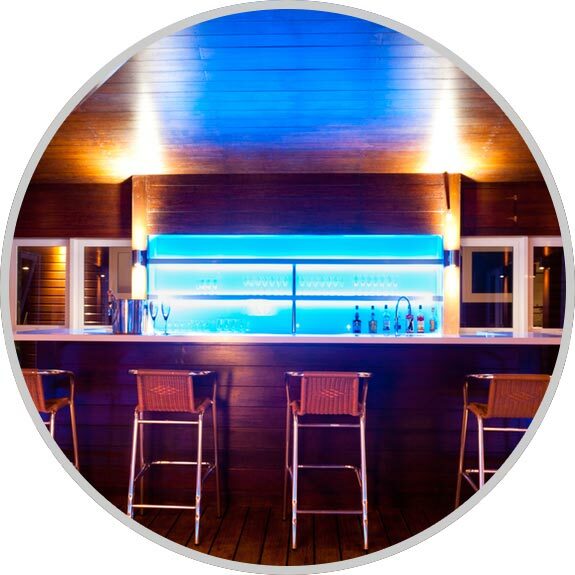 At Villa Isabelle, every reservation can include private concierge assistance to enhance your stay and let you just enjoy these delicate moments at Domaine des Fonds Blancs and all around Martinique. Our concierge service gives you the ability to order your groceries and have them delivered for free* – waiting in your refrigerator and cabinets for your arrival at Domaine des Fonds Blancs. * Please note that your purchases are at your own expenses. Research and organizing the implementation of a chef, service staff, the provision of meals by a catering service, all other activities (sea excursion or land excursions, …) and related to services that can be made in the department of Martinique and falling within the ability of a local private concierge.